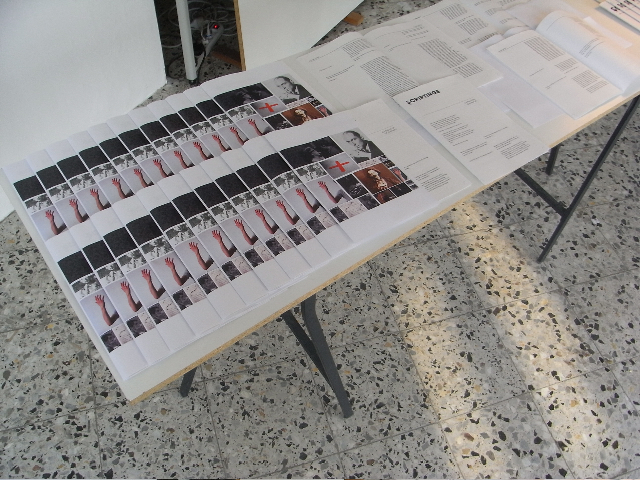 I have been working with Achim Lengerer on a presentation of SCRIPTINGS, his “traveling showroom and instant publishing house”, which I first encountered through Lecture Performance, a 2009 show at the Museum of Contemporary Art in Belgrade. 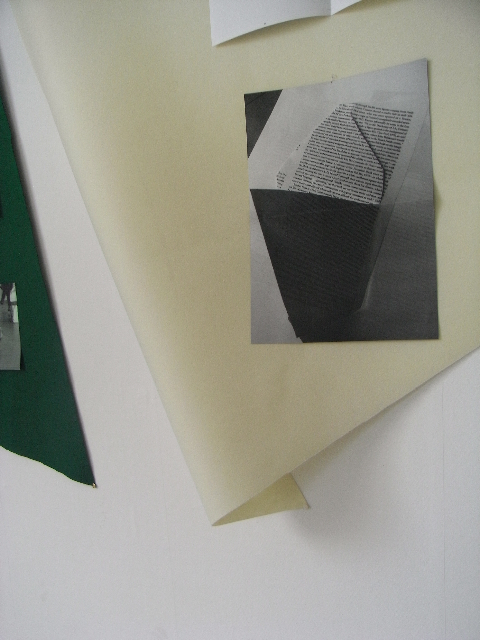 “Scriptings” functions as a discursive platform parallel and additional to Achim Lengerer’s solo-projects. Artists, writers, graphic-designers, performers as well as publishers are invited – all of which are working with the formats of”script” and “text” within their processes of production. The use of “script” or “text” does not necessarily head towards the final production of printed matters, but might result in the production of a movie, performance or object generated through processes of reading, writing or verbal utterance. 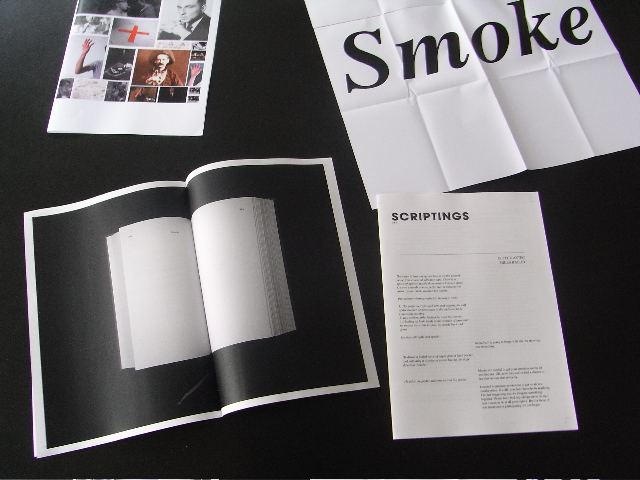 The presentations consist of live events (talk, discussion, reading, display, performance) as well as the instant publishing of the magazine “Scriptings”, which contains textual and visual materials provided by the participants. Invitation Only brings together a series of book works, pamphlets, readers, scores . that operate at the level of the invitational, instructional or propositional, as potential provocations or departure points prompting future action or enquiry. For the Sideshow Book Fair these works remain as invitations only: they prefer not to be sold – possessed by any single individual – but rather ask to be pursued, used and engaged with as part of the live event itself. SCRIPTINGS will also be presented as part of CRIT NIGHT 2 at Copenhagen Place in London on October 27th. More on that to follow. You and me talked QUITE a lot about my way of working, obviously touching methods of curating (but avoiding its terminologies … getting them out of my way). I’d put it like this: I make exhibitions, but I don’t necessarily make the single object or the art work. 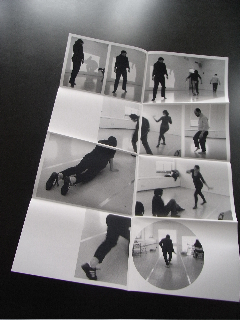 I perform the object and I narrate, I detail, I retell an EXHIBITION in its preparation, its making and its further life. From the beginning on I wanted the catalogue to be used AS material for a later EVENT. 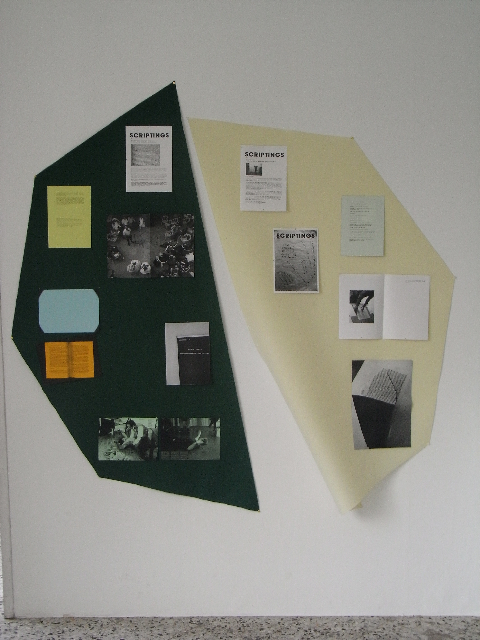 I always imagined the pages AS PICTURES within an installation that constructs and countermands transient meanings. Tonight I propose the catalogue as a projection, choosing a fugitive mode of presentation. 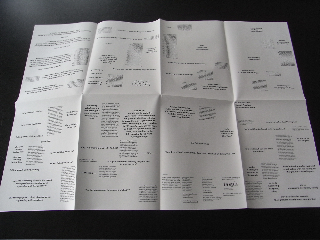 The installation will also include a full set of the 13 editions of SCRIPTINGS. A hint of the concerns and possibilities of these issues can be seen in the following list of titles, which will be available to read at SIDESHOW. #13 Practising La Prise de la Parole in collaboration with Kerstin Meyer, Ker Thiossane and Rosa-Luxemburg-Stiftung, Dakar and Schloss Solitude and IFA, Stuttgart, DE. MORE INFO: In 2010/11 Scriptings collaborates with IASPIS, Stockholm, SW; Ifa/Schloss Solitude, Stuttgart, DE and Ker Thiossane, Rosa-Luxemburg-Stiftung, Dakar,SN; KUNSTWERKE, Berlin, DE; Kunstverein Harburger Bahnhof, Hamburg, DE; Künstlerhaus Büchsenhausen, Innsbruck, AT; Sparwasser HQ and After-the-butcher, Berlin, DE; CNEAI, Récollets and Goethe Institut Paris, FR; W139, Amsterdam, NL. Upcoming Scriptings presentations: Salon light#7, CNEAI, Paris, curated by Sylvie Boulanger and Alexis Zavialoff. Scriptings#14: Le Moindre Geste, Künstlerhaus Büchsenhausen, Innsbruck, AT. Achim is currently writing his first novel in script-form, ZOOOOM I+II, which will be published in April 2011.